In front of Manerba del Garda, a few meters from Belvedere point, is small and graceful Island of Saint Biagio, more commonly known as Rabbit Island. It is a small Eden dotted with green fields, cypresses, and blooming bushes. As the name suggests, the main characteristic of the island that also makes it unique is the presence of a big number of wild rabbits that roam free on the island. These rabbits are used to being visited by the tourists who crowd the island during the summer. Tourists are also the main food and cuddle source for these friendly bunnies. The other peculiarity of this island is that in the summer, when the water levels are low, it is possible to reach the island on foot on a small strip of land that connects it to the mainland, and the water doesn't go beyond knee-height. It is a unique and exciting experience, accessible to the whole family. 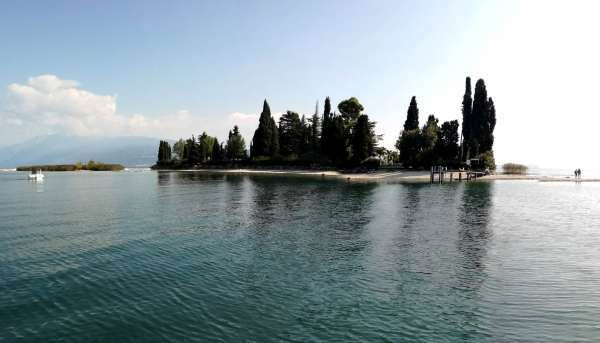 Rabbit Island is one of the many hidden pearls of the Brescian coast of Lake Garda and it can be easily reached by boat from Port Torchio. The Island is only 200m from the coast, and is property of Camping San Biagio. It is the natural extension of the Belvedere peninsula. In the middle of the camping ground is a villa from the 1600's and the island used to function as a hunting ground for the local nobility. It is also believed that the island was used as a testing ground for high-caliber fire weapons during the two world wars. The landscape is made up of green fields and cypresses that grow very close to the crystal clear water of the lake. Once you're on the island, you can lay down and bathe in the sun, dive in the lake's waters or eat a snack or ice cream the from kiosk available to tourists. Saint Biagio Island is open to tourists from the 1st of May to the 15th of September, from 9am to 6pm. In case of bad weather both the island and the kiosk are closed. From Salò you can view and admire this graceful island's beauty with our Itinerary 3. From every single corner of the island you can admire the wonderful landscapes that Lake Garda and its surroundings have to offer. To safeguard the maintenance of this unique place, from 2016 the Island of Saint Biagio became part of Natural Reserve of the Rocca, the Stone, and the Lake. It is the first example of protected area in Italy that includes a lake coast. This has also been done to preserve the water and the land's biodiversity, and to enhance and protect the lake's environment and fish fauna. From the Island of Saint Biagio it's possible to enjoy a gorgeous view of the Fortress of Manerba, placed on the peak of the hill in front of it. The Island of Saint Biagio is very popular with both tourists looking for some relax and scuba diving lovers. Close to the island is the famous Altar's cliff, one of the best known spots for diving on the Lake. Its wall reaches a depth of 150m, and its best known characteristics are its two big balconies covered in yellow sponges, and a cave that houses big specimen of royal perch, pike, tench, eel, and bleak. Those who go scuba diving in July may be lucky enough to meet schools of sardines moving towards the surface for mating season. According to local tradition once a year holy mass is held on the Altar's cliff, and fisherman can participate from their boats.